Get yourself inked isn’t a big deal. Just choose the design and ask the tattoo artist to draw it under your skin. Actually it is not that easy, because as you know that tattoo is quite difficult to be erased and if you want to make it easy, it will cost much. Here are some clues if you want to find some inspirations. Someone’s Name You Love or Admire So Much - The name of a person you love or admire so much in your life would be a great idea. It will be like a memento for yourself every single time you see the tattoo. But, be careful of what you are gonna choose, remember it will last forever. A Picture of Someone - It is quite difficult and the tattoo artist must be a professional on it. Drawing a picture of someone you admire or love will make you a living frame for them and that will be a great remembrance. Inspirational Quote - Inspirational quote is one of the most favorite things people ink to their body. You can quote one’s words or you can make it your own words. The inspirational quotes are not only good for you but for people who see it. Hidden Message - You can write a hidden message that you are the only one who know it. It just like you hide a treasure map in your body. 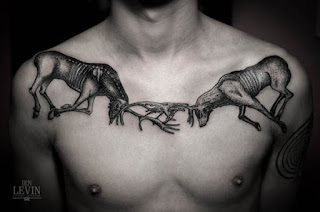 Those arr some ideas for getting yourself tattoed and then you can ask your tattoo artist to make some art touch on it. Wanna try it soon? Choose it wisely or to make it a sweet beginning, just make it in a small size in a hidden place.